Tiger Bill reviews Musical Drumming in Different Styles DVD by Gregg Bissonette from Alfred Publishing. Musical Drumming in Different Styles offers Gregg Bissonette's approach to stylistic drumming. This two-disc DVD features Gregg's approach to musical drumming and the music business in general. Let's see if it's worth your time and money. In each chapter, Gregg plays a song and then breaks down what he's doing so you can understand what's going on. Elements of Funky Drumming: This segment includes a performance of the song Marbles with Gregg breaking down and demonstrating the main drum parts he plays including the basic groove, incorporating paradiddles, the 777-9311 beat, song form, beat displacement, and an upside down snare drum demo. Pop/Rock Grooves: This segment features the song Submarine played and sung by Gregg. Discussed is hearing protection, playing drums while singing, using the crash cymbal for your ride, choosing the right kit for the music, drum fills, flams on the drumset, and drum solo ideas. Playing in Ringo's Band: Gregg talks about his first hand experience working in Ringo's band and getting to play double drums with Ringo. Afro-Cuban Drumming: No Hay Parqueo is the Afro-Cuban selection Gregg plays on this segment in a band featuring his brother Matt Bissonette on bass and trombone (who also wrote all of the songs featured on this DVD), Gregg on drums and trumpet, Gary Hoey on guitar, and David Garfield on keyboards. Gregg also covers Afro-Cuban drumming, Clave, Cascara, cutting horn figures on the kit, soloing, and phrasing. Jazz Time: Gregg opens this segment playing a tune inspired by Elvin Jones called Lum Lum. Gregg breaks down what he's doing on the tune including the necessary instrumental balance and the importance of the ride cymbal when playing jazz. Play and Listen: Gregg offers his take on the importance of listening when playing drums whether you're a studio musician, playing live with a band, or practicing by yourself. Obligatory Drum Solo: Self explanatory with Gregg playing an appropriately musical solo here. Special Features: Include Alternate Camera Angles, Transcriptions, Photo Gallery, Web Links, About Hudson Music, and Public Service Information. Odd Times: This segment features the tune Noah's Ark with Steve Vai on guitar and Matt Bissonette on bass. The tune bounces between 7/8 and 4/4 time. Gregg's breakdown includes tips for playing odd time signatures. Big Band Drumming: Gregg talks about the articulation needed to play effectively with a big band, importance of being able to read music, fills used for setting up kicks with the band, and various big band styles. Big Band Swing (Medium Tempo): Gregg plays drums along to a pre-recorded tune where Gregg recorded all the horn parts himself with his brother on bass to demonstrate proper setups for big band kicks. Included a discussion and demo of chopping wood! Big Band Swing (Fast Tempo): An up-tempo big band tune featuring Gregg on all horns again - and drums - along with Mark Adam Watkins on piano. Playing Rock Grooves While Singing: Gregg plays Train to Willoughby, which features Steve Stevens on guitar, Matt Bissonette on bass and background vocals, and Gregg on lead vocals and drums. Gregg breaks down covers what he's playing on the tune including his use of New Orleans Second Line grooves and his favorite method of tuning and pitching his tom toms. Studio Drumming: Gregg offers tips on being a better studio drummer including a demo of his sound check groove and how being a good chameleon can help you become a valued studio player. Blues Shuffle: This time the tune is called Cloudy Day (Robben Ford on guitar, Matt Bissonette on bass and background vocals, Kathy and Greg Bissonette on background vocals) and Gregg demonstrates various shuffle grooves. Piano Blues Song Form: Gregg feels that it's important for drummers to have a working knowledge of piano and guitar, and he plays a standard blues song form on piano. The Gigging Drummer: Tips on how to be a better gigging, working drummer including the fact that only about fifty percent of the gig is actual drumming while the other fifty percent consists of attitude. Tribute to Tony: This is Gregg's tribute to fusion pioneer, and former instructor, Tony Williams. Gregg covers some of Tony's favorite techniques including the importance of passion to drumming. Closing Tips: Gregg drives home the importance of playing musically and playing for the song as the single most important job of a drummer. Special Features: Include Alternate Camera Angles, Bass Drum Insert, Warm-Up, Equipment, and CD Plug. For a DVD that contains four hours and twenty minutes of material, I have to say I wasn't bored even for a minute. Gregg has the right mix of talking, performing to tracks, and demonstrating throughout and he shows that he is also quite a character himself, in addition to his ample skills behind the drumset. If you didn't know Gregg personally before watching this DVD, you'll get the feeling that you know him quite well afterward. You'll see exactly what I mean when you check out this DVD, which I highly recommend to DrumHeads of all skill levels who are interested in becoming better musicians. 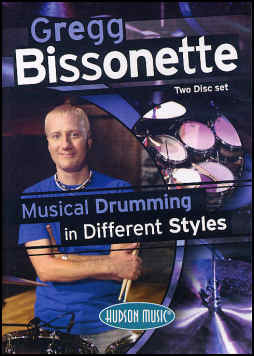 This DVD, from Hudson Music, is a good value at its suggested retail price of $49.95 and is also available at a discount online: Gregg Bissonette-Musical Drumming In Different Styles.